When Paul Cornell returned to Marvel, it was with a pitch that would transform Wolverine’s life. With the benefit of hindsight, this series began an arc that would culminate in Wolverine’s death; and yet, when you read through interviews from the past few years, you don’t get the sense that this was always as inevitable as it now seems. Cornell’s aim was not to kill Wolverine, but rather to change his status quo; to introduce an element of ‘threat’ to Wolverine’s life that had always been missing. At the same time, Cornell challenged himself to write both a story rooted in the wider Marvel Universe – featuring characters ranging from the new Nick Fury to Batroc the Laper, and heading to locations like the Microverse and Wakanda. And yet, he aimed to make the book extremely accessible, deliberately choosing to avoid flashbacks or deeper narratives, at least until the final ‘Killable’ arc. Sabretooth, the Hand, Mystique, the Howlett Estate… The conclusion of ‘Killable’ really did pull us into Wolverine’s broader world! The series only lasted thirteen issues, and in truth it told a single story; a sentient virus from the Microverse threatens the world and builds in power. By the mid-point, in ‘Drowning Logan’, the virus has stripped Wolverine of his healing factor; by the conclusion, in ‘Killable’, this becomes permanent. Remarkably, the series is truly self-contained, with no crossovers or tie-ins. It’s an excellent, and rather fun, series to read. ‘Hunting Season’ (#1-4): Wolverine and S.H.I.E.L.D. face a deadly threat, a virus that seems to be ominously sentient! ‘Drowning Logan’ (#5-6): The virus’ origins are revealed, and Wolverine is stripped of his healing factor. ‘Mortal’ (#7): A single issue, in which Wolverine deals with the emotional impact of losing his healing factor. ‘Killable’ (#8-13): As S.H.I.E.L.D. work against the virus, Wolverine’s enemies pull him into a trap – on the site of the old Howlett Estate. Cornell takes Wolverine through the wringer, facing him with his own morality – even such basics as shaving become difficult, as he’d never bothered to be careful before. 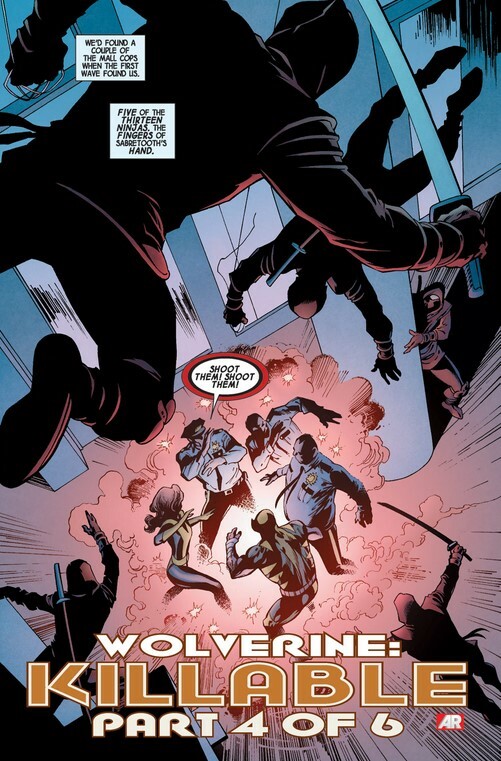 The emotional centre of the story is undoubtedly in ‘Killable’, where, wisely, Cornell teams Wolverine up with Kitty Pryde and has him face off against a wide range of threats. In Wakanda, Cornell draws upon the Black Panther – Storm – Wolverine triangle to see how a berserker rage would work for this Wolverine; then, he has Sabretooth pull Wolverine into a devastating confrontation. 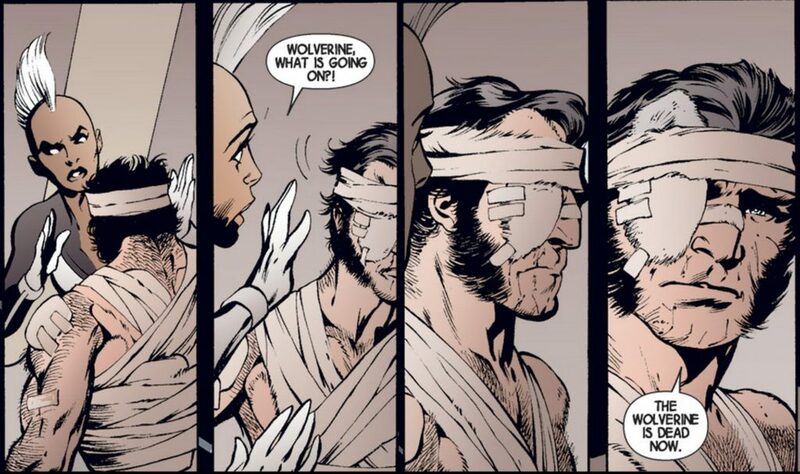 By #13, Wolverine is emotionally broken, defeated as never before. Alan Davis’ art, while well-suited to the tone, occasionally glitches… Check out the eye-patch! Cornell’s view on this was simple: change is good. At this stage, Cornell had no idea where that change would lead, and had his eye on a long road – but, of course, Marvel’s plans coalesced in a very different direction. This is the story behind the death of Wolverine, and it’s an essential part of the modern X-books. Paul Cornell’s run on Wolverine should be avoided at all cost. The reason they had to kill Wolverine is because Cornell ruined him. He made Wolverine a coward. Think about this, have you ever read a comic book where the hero flinches? I don’t mean metaphorically. I mean literally flinches. From the moment Wolverine lost his healing factor, he’s flinching at one thing or anther. The covers were the worse. Every single cover he’s flinching, and hands up, don’t hit me pose. One cover he’s hiding behind Kitty Pride, hands up cowering in fear.It was the saddest thing I have ever seen. He made Wolverine into a man that was only brave because he could heal. Why would I want to read that? I wouldn’t. He made Wolverine unreadable. I kept thinking “who decided it was a good idea to make Wolverine a coward”. Tons of other X-Men don’t have healing factors and they are not running scared. Wolverine is a trained Samurai. Taking his healing factor was an opportunity to make him even more interesting, Instead we got what we got. As I’m reading Cornell’s run I keep thinking is anyone else at Marvel reading this? Then almost to the end of his run Wolverine meets Lady Death and she says “up until now your acts of true bravery have been rare”. What? Bleep you Cornell! Bleep you hard! So tell me, what was Daniel Way writing or Claremont or Miller (Frank and Mark) or even Peter David, Jason Aarron and Greg Rucka. Those men wrote great stories of a brave, complicated character and Cornell tried to sweep it all away. It was in a phrase….hot garbage. Thank god they brought in Soule to write Wolverine’s death. He basically ignored the character that Cornell created and gave a short and to the point ending. It was actually decent. In the end he sacrifices his life to save those people and save the world form more weapon X killing machines. It was not just that he sacrificed his present life. He also sacrificed his old life too. He could have given himself the healing factor injections instead of giving it to the people in the lab to save their lives. That’s the Wolverine we know. That guy Cornell wrote about? Avoid him. I both agree and disagree. I do think you’ve hit the nail on the head; Cornell’s take on Logan is very odd, and sometimes uncomfortable. At the same time, I do note that – for a Samurai – Wolverine has a habit of just running straight into battles irrespective of the damage he takes, suggesting that his whole fighting style assumes his healing. So I could accept that the loss of Wolverine’s healing factor would shake him to the core. I’m just not convinced we ever found the character’s core. Where I disagree is, I wasn’t too impressed with Soule’s interpretation in Death of Wolverine, which just felt disjointed to me. I also think Marvel had to kill Logan for a lot of other reasons; I think he’d been overexposed, his sales had been declining for years, and he simply needed a break before being brought back. I want to read death of wolverine because it’s all I’m hearing about and I’m trying not to listen. What should I read 1st so I can get a complete picture of wolverine. I want to know from the start. For the very start, I’d recommend Chris claremont and John Byrnes Uncanny X-Men. This is when wolvie first joins the x-men. Start with Giant Size x-men #1 from 1975 and then proceed to Uncanny X-Men #94 and enjoy! I have read origin 1 and 2. Was going to read before x-men and start from there? You could definitely start with Origin, that works chronologically. Personally I prefer getting to know Wolverine on the X-Men, but nothing wrong with his origins first!